A simple Promissory Note evidencing a promise or other obligation to pay a sum of money, designed for use when U.S. law applies. You need this document if you want a written record of a promise to pay a sum of money. It is designed for use under U.S. law. 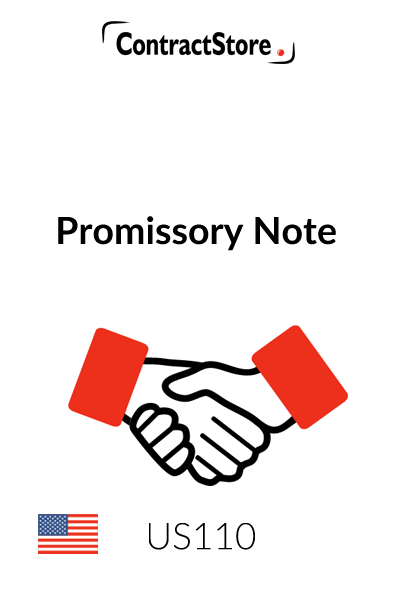 A promissory note is a legal document that evidences the promise or other obligation of one person (“Maker”) to pay a sum of money to another person (“Payee”). The form contained in this document can be signed as Maker either by an individual or by a corporation or other entity. Under this form, Maker agrees to make principal and interest payments to Payee. A promissory note may be secured or unsecured. If secured, the parties typically will also enter into a separate security agreement, pledge agreement or mortgage. Although paragraph 7.3 of this form allows for the possibility that the parties may enter into a separate agreement of this type, the form of such separate agreement will vary dramatically depending on the nature of the collateral, and therefore no attempt has been made to provide a form of such agreement. 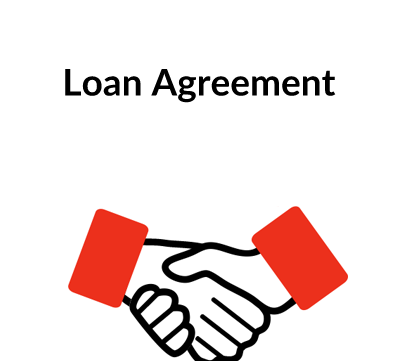 If the Note is secured by reference to a separate agreement, it will also be necessary to “perfect” the security interest or mortgage, usually with a notice filing with the appropriate government agency. This form is intended for use in any state in the United States. However, as is the case with any agreement for use in the United States, regard must be had for the possibility of variations in the laws from state to state. In the context of commercial relationships, the laws do tend to be substantially similar among the states, but there are areas of substantive difference. For arrangements where interest may be payable, regard must be had for the effect of state usury laws, which frequently limit the rate of interest that may be charged to certain borrowers. Paragraph 7.2 of this form attempts to accommodate the impact of usury laws by providing for a reduction of the interest rate payable under the Note in certain circumstances, but it is nevertheless worth checking local state law for several reasons: (1) some states allow the overcharged debtor to recover just the interest overcharge, but some allow the debtor to recover a multiple of the interest overcharge; (2) there may be criminal liability for usury in some states; and (3) it is always preferable to avoid an unpleasant surprise – that the interest that Payee thought would be payable is, in fact, not payable. 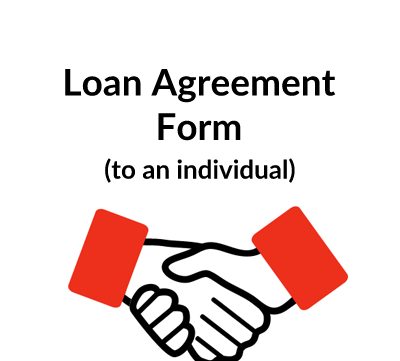 This form provides a good starting point for preparing a first draft of a promissory note. However, as with use of any form, it is very important to take the time to read the form in its entirety to ensure that it is customised appropriately for use in your individual situation. For all but the simplest of transactions, it can be anticipated that some customisation will be in order; and as mentioned above, it may also be advisable to consult with competent legal counsel. This information should be inserted at the beginning of the document. Alternate signature blocks are included to accommodate execution by a corporate Maker and an individual Maker. These should be customised and deleted as required. The italicized language in brackets is for guidance only and should be deleted. Payee need not sign the Note, as Payee has no obligations thereunder. Paragraph 1 contains the promise to pay. The names of Maker and Payee, as well as the place for payment and the principal amount should be inserted in the relevant blank spaces. 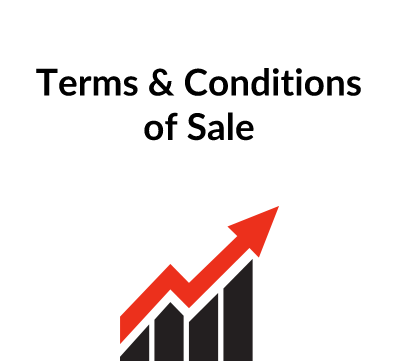 Paragraph 2.1 provides that interest is simple interest and also defines the interest rate. A number of interest rate options are presented: (i) a fixed rate; (ii) based on the reference rate of a defined bank; (iii) based on the prime rate of a defined bank; and (iv) based on the discount rate of the Federal Reserve Bank. The options that are not used should be deleted; with regard to the option that is used – the brackets and the language in italics preceding the option can be deleted, the blanks should be filled in as agreed upon by the parties and the language can be moved up to be next to the words “. . . will bear simple interest . . .” in the lead-in sentence. Paragraph 2.2 simplifies the computation of interest. 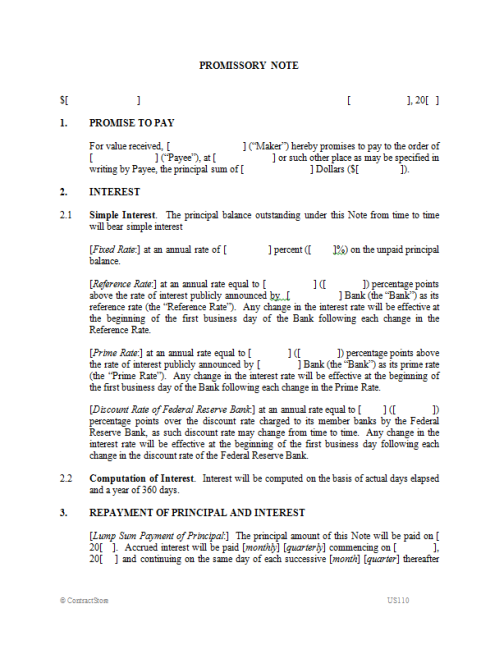 Paragraph 3 provides for repayment of principal and interest, and again, a number of options are presented: (i) lump sum payment of principal with periodic payments of accrued interest; (ii) fixed installment payments of principal and interest (principal and interest on the same schedule); and (iii) fixed installment payments of principal and interest (principal and interest each on different schedules). The options that are not used should be deleted; and in the option that is used, the blanks should be filled in as agreed upon by the parties and the brackets and the language in italics can be deleted. Paragraph 4 allows Maker to prepay the Note without penalty. Paragraph 5.1 defines what constitutes an event of default under the Note. Essentially, an event of default arises when Maker is in breach of the Note or some other agreement, or if Maker becomes subject to bankruptcy or insolvency proceedings. The five clauses of paragraph 5.1 offer a number of choices, any of which could be used separately or all of which could be used together. Within some of these choices, alternate language is presented which should be reviewed and then either used or deleted. Under paragraph 5.2, the consequences of an event of default are three-fold: (i) the interest rate increases by a number of percentage points stipulated in clause (i) of paragraph 5.2; (ii) Payee can choose to accelerate Maker’s obligation to make payment; and (iii) Maker becomes obligated to pay Payee’s costs resulting from the event of default. Choice of law can be contentious in U.S. contract negotiations because there are 50 states to choose from, and each party may have an instinctive bias in favour of using its own state law. Unless there is some reason to pick another state’s law (e.g., more favourable substantive law), it is customary to pick the laws of the state with which the drafting party is most familiar (again, usually its own state). This choice of law provision picks the laws of a single state (federal laws apply regardless of the state law election), which is most likely to be respected by the courts if it has some relationship to the Note (subject to application of mandatory principles of local public policy). Paragraph 6.2 of this form assumes that the parties will want to resolve any disputes by litigation in a state or federal court in a stipulated city/state. Paragraph 7 contains some miscellaneous clauses. In paragraph 7.1, Maker waives some defences commonly raised against demands for payment of a promissory note. Paragraph 7.2 attempts to protect against the impact of usury laws (described above). Paragraph 7.3 is optional language in the event that the Note is secured by a security agreement, a pledge agreement or a mortgage (also described above). Brackets and language in brackets that is redundant should be deleted.